PRODUCT: 1-1/8 in. 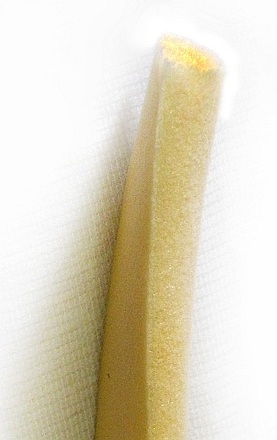 D-SHAPED FOAM BACKER ROD, OPEN CELL YELLOW FOAM (very soft). 550'/BALE, 2 BALES/MASTER BAG (1100 feet total). PRICE/MASTER BAG. (UPS shipment only). Yellow polyethylene extruded open cell foam. Compatible with all know types of sealants and chinking materials including butyl, polyurethane, silicones, tri-polyimer, polysulfide, acrylic, etc. Meets ASTM D5249, C1330 D1056. Foam allows air to both sides of sealant, increasing cure rates.